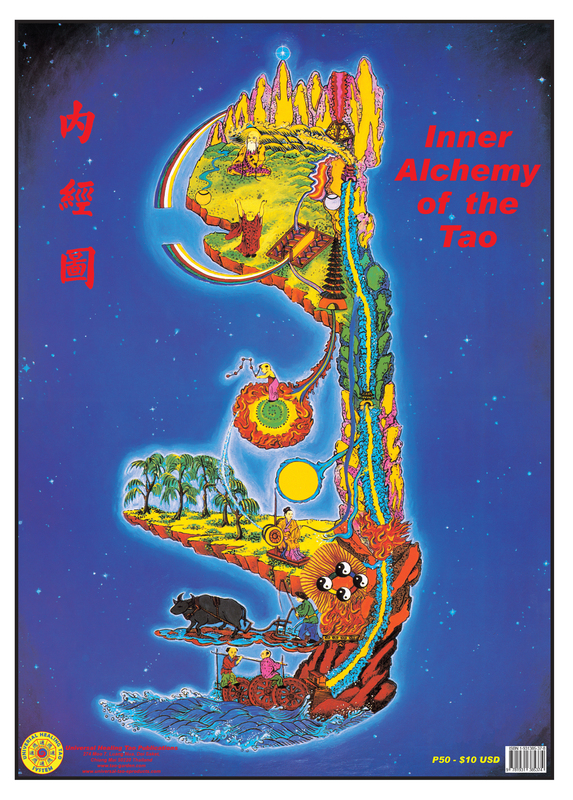 This poster illustrates beautifully Color Rendering of an ancient Taoist Drawing describing the Natural Movement of the Microcosmic Orbit in a Natural Setting going from each one of the Microcosmic Point. After we learn how to feel the internal smiling energy (Inner Smile), cool it down (Six Healing Sounds) and break up any blockages (Chi Self-Massage) then through the Microcosmic Orbit we can feel it move and direct it to heal the body. This is how we learn to move the generated love within ourselves and the abundance of that love within will spread to others energetically across time and space. We will learn how to harness excess sexual energy and transform it into Chi, or life-force energy. When we circulate the sexual energy in the Microcosmic Orbit, a continuous energy loop that runs up the spine and down the front of the body, we transform it into self-healing energy that can be stored in the organs and the Three Tan Tiens: Energy Centers in the Brain, the Heart Center, and the Lower Abdomen. By learning to open the Three Tan Tiens to the Six Directions, the Taoist practitioner combines Mind Power with the extension of Chi to draw cosmic energy into the body. When we learn to flow in this way of the Tao, life ceases to be a struggle.